Such lovely Bach music as the Prelude in C is music every piano student should eventually have in their repertoire. Fortunately, it is not very hard, even in its original form, offered here as a free printable download. Please scroll down the page for the printable PDF links. What events is this Johann Sebastian Bach music suitable for? This beautiful and famous piano music makes great wedding music. It makes great church worship prelude music. It makes great piano student recital music! Although it may sound -- and look! 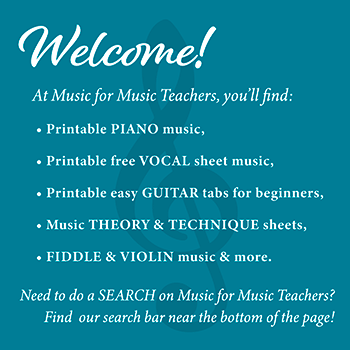 -- complicated to your students at first, they will likely be enchanted when you point out to them that every measure is just a repeating broken chord pattern. This pattern changes by only a few notes from one measure to the next. Also, the hands take turns playing, one at a time. Perfect for younger students. When your students' hands can reach an octave, and they are beginning to recognize chord inversions, they will be able to learn this piece easily. Here is Johann Sebastian Bach, in a bite-sized chunk! In an effort to press more classical music upon my students, I started something new last year which I call "Classical Samplers," or "Classical Soundbites." These are short excerpts from longer, mostly very famous piano pieces, that capture the flavor of the whole piece, but may be as short as 4 measures. In this way, my students can get exposure to many more pieces in their original, not arranged, form. Along with their regular lesson material, they will be working on a small segment of a longer classical work. Do they want to keep going and learn the whole piece? Some of them will, but others are satisfied with just an introduction. We all know what an investment of time -- months! -- it can be to commit to a whole piece of classical music. If and when they do come back to it, they will be PRIMED. Students whose hands are too small for the octaves, or who aren't ready for such a long piece, won't be overwhelmed by this large-note version of the first 4 measures of the Bach C Prelude. P.S. Parents love the soothing, repetitious sounds of this Bach music, the "Praeludium I" in C... it can be very restful on the ears!